Group Member Evaluation structures the process for students giving feedback on their peers' skills. All our tools are set up in steps. In Step 1 you will set overall instructions. In Step 2 you set the feedback deadline, criteria, and the required amount of evaluations each student has to submit. In Step 3 students read the feedback they received and (if you require them to do so) write a reflection on the feedback they receive. First fill in a Title, then continue to Step 1. Fill in instructions. Fill in your overall instructions for the assignment (see the screenshot below for an example). Note that if you leave this field blank, you will not be able to publish/save the assignment. Work individually, review individually. Students are randomly and automatically assigned a peer to give feedback to. Use this option if, for example, you want students to give their peers feedback on solo presentations. Work individually, review within groups. Students are randomly and automatically assigned a peer from within their own group. Use this option if you want students to evaluate their peers' contribution to group work. 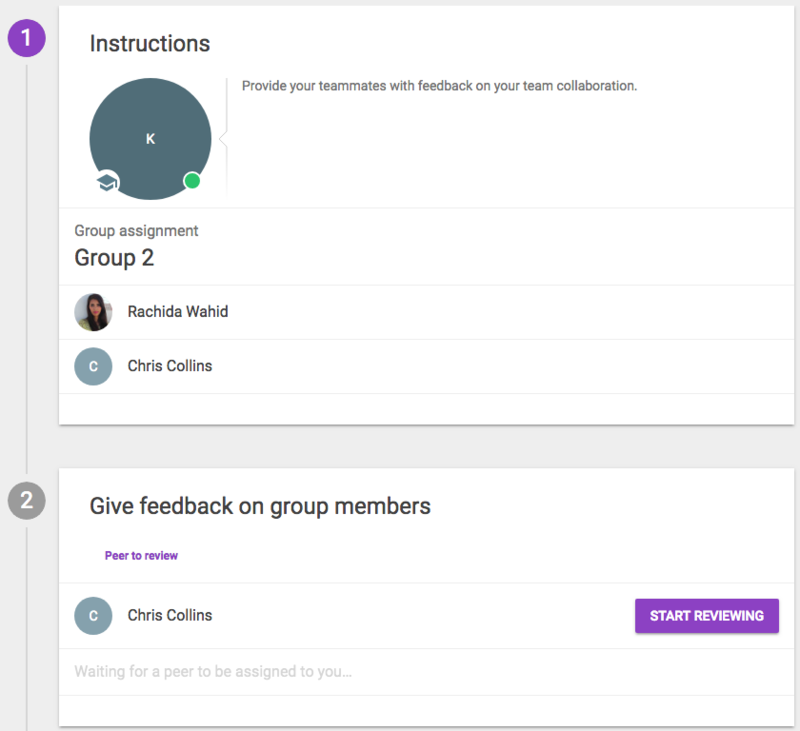 Work as group, review work by other groups individually. Students are randomly and automatically assigned a group other than their own to review. 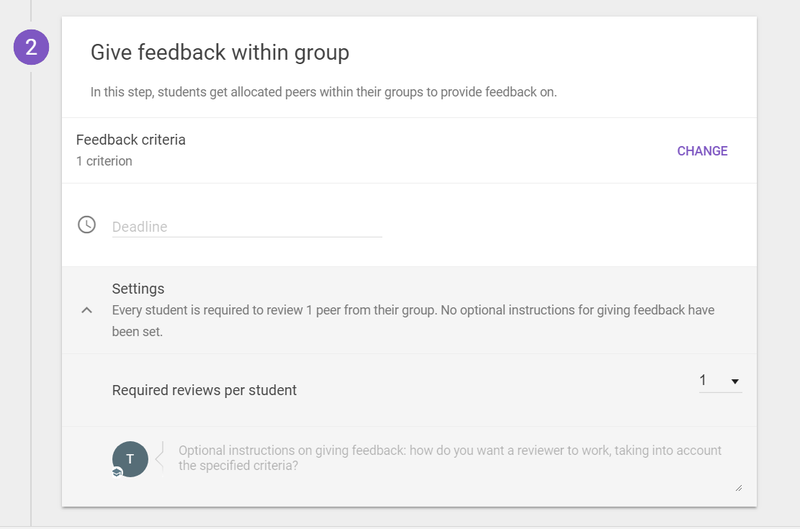 Use this option if, for example, you want students to give feedback on group presentations. If you choose options 2 or 3, you will have to configure the groups. 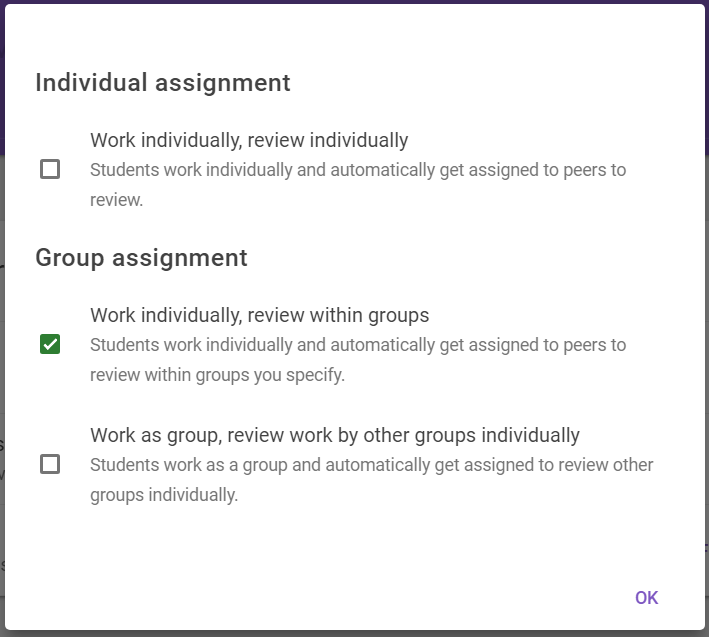 Note that you can only configure groups when students have been added to the assignment. Required reviews per student Specify how many peers/group members/groups each student will review. If you have chosen group option 2 and you want all peers to review each other, please select "all". If you require more than one review from each student, you can choose to instantly assign all available peers, so students will see all the peers they'll need to review straight away, rather than having to complete the first review before continuing with the second. This is what a student will see: he sees his teammates at step 1 (including himself) and at step 2 he sees the peer that he needs review. When finished with the review, the student will see 'reviews received' in green with a tick. 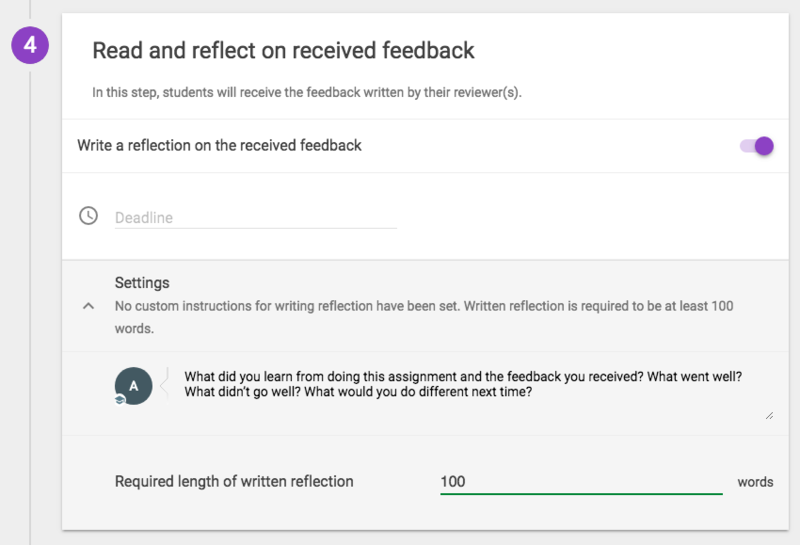 You can also set (optional) instructions for your students to keep in mind while they give feedback. Written reflection (optional). This reflection written reflection by the student who received feedback is visible only to themselves and the teacher.